Medtronic, Inc. has announced a series of recalls involving components used with its Heartware Ventricular Assist Device (HVAD), a blood pump indicated for patients awaiting heart transplants. The U.S. Food & Drug Administration (FDA) has identified a number of these actions as Class I recalls, which indicates that use of the affected devices could result in serious injury or death. The nationwide law firm of Bernstein Liebhard LLP is investigating injuries and deaths that may be related to faulty components included recent Heartware Ventricular Assist Device recalls. If you or a loved one suffered serious complications due to a malfunctioning HVAD, please call (888) 994-5118. 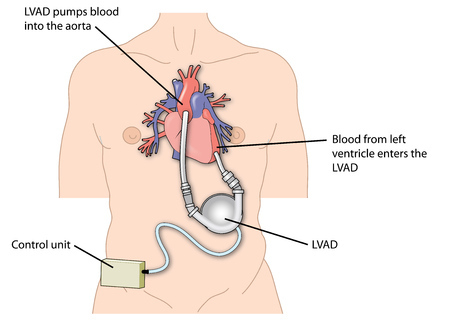 The Heartware Ventricular Assist Device is a blood pump implanted in patients at risk of death from end-stage left ventricular heart failure, and who are awaiting a heart transplant. These devices can be used in or out of the hospital, including during patient transport situations. In October 2016, Medtronic announced a recall for HeartWare Controllers due to a power connector problem that could cause the rear portion of the pump’s driveline connector to detach from the front portion. A loose connector could allow moisture to enter the HVAD controller, resulting in malfunctions that could lead to death or other serious adverse health consequences. The FDA has declared a Class I recall – the most serious recall category –for the affected Heartware Ventricular Device controllers and adapters. In March 2017, Medtronic, Inc. recalled certain Heartware Splice Kits that are used to repair the HVAD’s driveline in the event of an electrical break. According to the company, a design problem could prevent the repaired cable assembly from withstanding excessive force or pull. This could cause damage to the cable assembly and interrupt electrical connection, leading to serious adverse events or death. The FDA designated Medtronic’s action a Class I recall in May 2017. Those affected by this recall include healthcare providers who used the HeartWare Ventricular Assist System Pump Driveline Splice Kit prior to April 2015, as well as patients who underwent repairs before that date. Lots involved in the recall include those used prior to April 2015 bearing product codes SY00116 and ASY00281. The recalled products were distributed from January 11, 2011 to May 23, 2014. On March 16th, Medtronic’s customers were informed that a new driveline splice kit was available. Healthcare providers should determine whether performing a re-splice procedure is appropriate for patients who had a driveline repair performed with the original splice kit. The pump must be temporarily stopped during such a procedure, which could expose the patient to a risk of serious injury or death. For this reason, the driveline splice procedure MUST be performed by a minimum of two trained HeartWare technicians in a controlled clinical setting. Individuals who suffered serious or life-threatening complications related to a Heartware Ventricle Assist Device recall may be entitled to compensation for medical bills, lost wages, pain and suffering and more. To ensure that your legal rights are protected, please call Bernstein Liebhard LLP at (888) 994-5118.